So, been sick. Children, they’re basically walking petri dishes that deposit germs on you. Anyway, back to it today. And nothing fancy, nothing terribly skillful, just milling timber to rough thickness. Retrieved the mitre saw stand I bought from lidl a few weeks ago out of the attic, set it up, and mounted the Dewalt to it, spent a while faffing about with the mounting screws discovering that I’d fastened it down using the screws that are for adjusting the infeed and outfeed tables that are built into the thicknesser and had to re-mount it (turns out the thing won’t mount to the lidl stand quite perfectly because it’s too wide, but it’s stable enough to work). 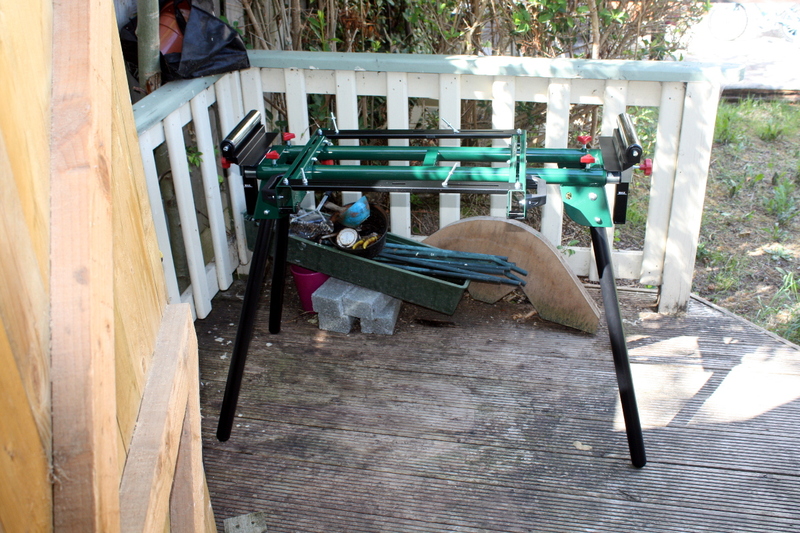 I was going to mill up the two sides as well as the two remaining shelves, and the sides are just too long to do this in the shed, so I waited for a Saturday afternoon and did it all on the little decking area outside the shed. 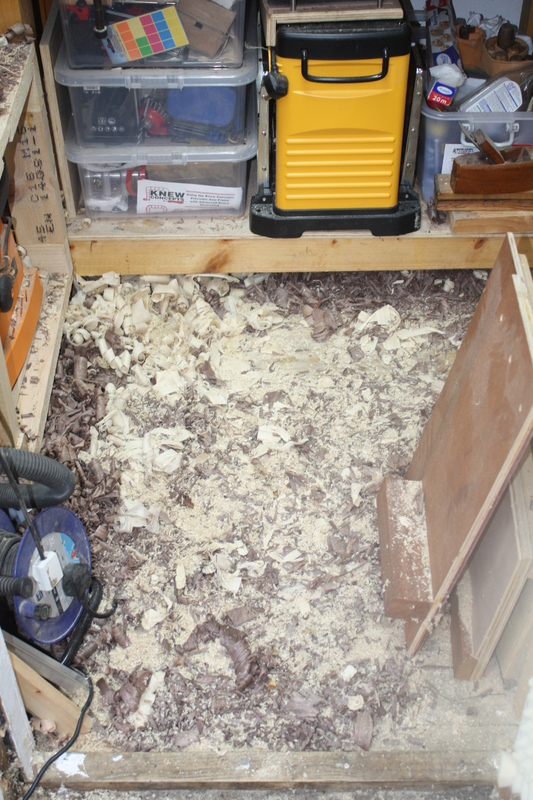 Which, noise-wise is a bit obnoxious, but this is a one-off (normally milling only happens for a short period at the start of the project, and on top of that, normally I’d mill up in a soundproofed shed so it’s as noisy to the neighbours as someone mowing a lawn, but with an annoyingly higher pitch). Anyway, the plan is to not do this in an evening and to try to time it all for Saturday afternoons if needed, and mainly not to need it by not picking projects which are physically too big to fit in the shed readily. That needs to be a bit more of a cast-iron rule really. Anyway. Rigged the machine, faffed about with setup, then took the boards (which I’d checked were flat on one side and had flattened by hand if they weren’t) and ran them through the thicknesser taking off a mm or so at a time until I was down to an inch for the sides and just under for the shelves (it’s kid’s furniture, I’m aiming less towards elegance and more towards brick shithouse). 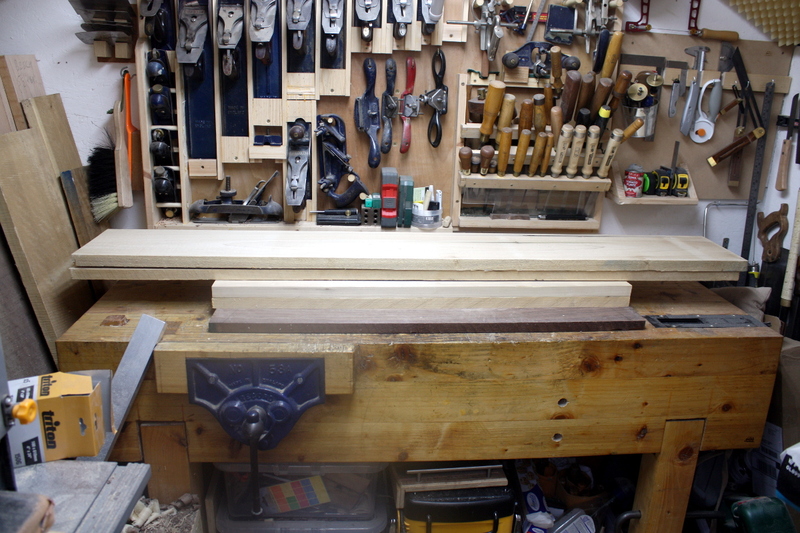 It took under 30 minutes to do all four boards from inch-and-a-quarter down to planed, flat inch thick boards. Previously, that would have been most of a week’s evenings doing donkey work that was boring and sweaty and which tore up my hands. Like I said, I don’t like using the machine, but I love what it does. 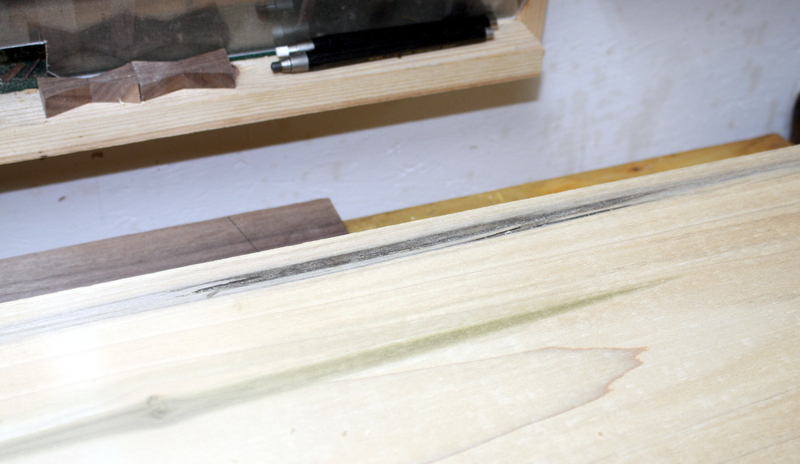 Now I get to do fun stuff for the rest of the time, like shaping and joinery and finishing work and inlay and so on. But I can do all that by hand readily enough. 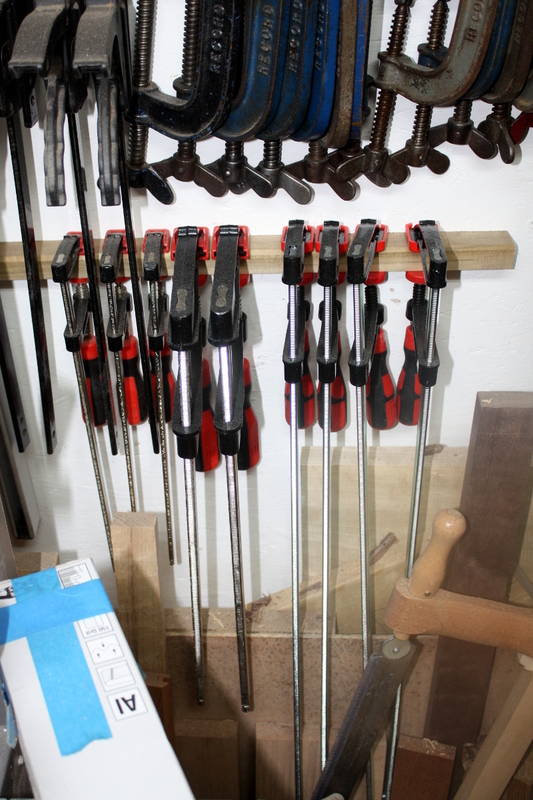 At most, a cut or two with the bandsaw. And of course some router work for the sliding dovetails. But nothing as obscenely loud as the thicknesser. Still messy and needing a proper clean. Might do that tomorrow so I can start into the fun stuff without wading through shavings. In other news, Boss Lady got her locker and loved it, especially the colour. 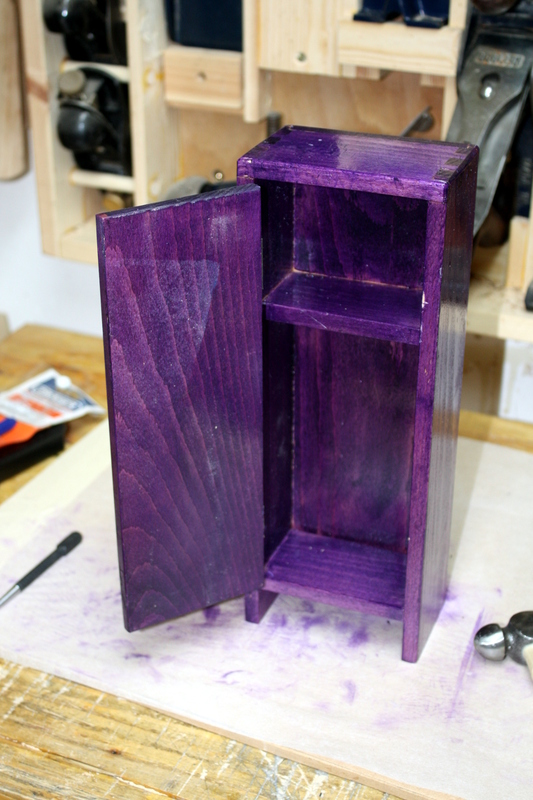 Actually, little projects like that can be a bit fun and a nice way to practice things like inlays or kumiko or making shoji (no idea how that’d get worked into bunk beds, but you know what I mean). And then to top it all off, I finally bit the bullet and bought myself a proper combination square. A Starrett, no less. Purple is reserved for royalty isn’t it? Oh, Queen of the mansion, I get it. Although it is about bamboo cane, it might work with wood.